As an updated version of the original Rock and Roll, the Smart Kurt Kinetic New Rock and Roll turbo trainer has evolved to address potential limitations of the original design and bring a great added user experience. 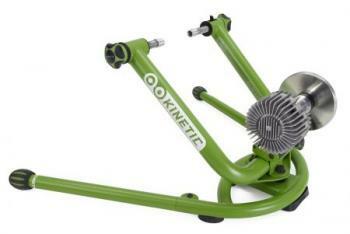 It is now a Smart trainer that comes with Kinetics InRide hardware. This means you can have data driven workout using the InRide app. Using its patented frame, the New Rock and Roll trainer simulates reallife bike movements. Using a mobile frame that can tilt and shift as it would on the open road, this not only adds to the user realism, but also introduces a core workout to your body due to continuous stabilisation throughout your ride. 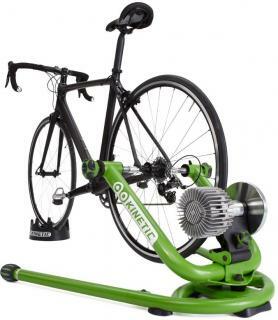 The New Kinetic Rock and Roll turbo trainer is compatible with the Kinetic inRide Watt Meter for power training, and comes with a lifetime warranty. The trainer uses a fluid resistance brake that offers resistance up to 3000+ Watts. It fits 22” to 29” wheels so that it opens up the options for most bikes on the market. 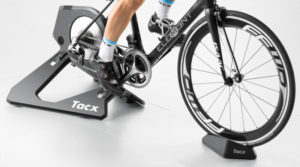 Also, for added ease the New Rock and Roll trainer comes fully assembled out of the box, and to address potential user issues with the original design, the riders centre-of-mass is now placed centrally over the frame. Check out the video on our blog post to hear about modifications to the New Rock and Roll trainer.